I am a huge chocolate fan, who isn't right! When chocolate is for a good cause I love it even more. I learned about the Women's Bean Project from another mom blogger. They are a non profit organization that is helping woman emerge from poverty and unemployment by teaching job readiness and life skills for entry-level jobs through employment in their gourmet food production and handmade jewelry manufacturing businesses. They have wonderful goodies to eat and beautiful handmade jewelry. For our Valentine's Day event we had the opportunity to review one of their gift baskets. We selected the Chocolate Lover's Basket. I loved the basket that came along with our goodies. It now sits on my table holding bills and important papers. Much better than the ugly box I had it in. The treats inside the basket were delicious. I really loved the Chocolate Espresso Beans! My son seemed to enjoy the Chocolate Mint Candies, which surprised me since hes not much of a sweets eater. My husband liked being able to bake the brownies. The brownies were very chewy and delicious. I decided to make the cookies myself and I kind of burned them! They are chocolate oatmeal and the batter started out dark so I was not sure if they were done so I over cooked them. A little milk and a scraping later I still ate them! I liked that the name of the person who assembled the treats were on the bags. It gave it a personal touch that we smiled about knowing someone made it for us who was improving their life. Since 1989, Women's Bean Project has been dedicated to helping women break the cycle of poverty and unemployment. Our Mission: To change women's lives by providing stepping stones to self-sufficiency through social enterprise. Our Vision: Women’s Bean Project strives to break the cycle of chronic unemployment and poverty by helping women discover their talents and develop skills by offering job readiness training opportunities. With this stepping stone toward success, the women will be able to support themselves and their families, and create stronger role models for future generations. You can learn more about donating to the Women's Bean Project by clicking here. If you would like to learn more about volunteering to help the Women's Bean Project you can click here. He really liked the packaging! I had the bow on his head but he wouldn't let me take his picture. The Women's Bean Project has generously offered a Chocolate Lover's Basket to giveaway to one of my lucky readers. *Limited to US residents; 18 years old and above. Giveaway starts January 28, 2011 and ends on February 7, 2011 at midnight PST. Winner will be emailed and has 48 hours to respond before another winner is selected. I was not paid for this giveaway or post. I was sent for free the Chocolate Lover's Basket to review for this post. This is such an awesome company! Thanks for sharing it with us!! I'm glad there are companies out there that give others a second chance to change there lives back around. I follow Woman's Bean Project on twitter (@shala_darkstone). I "Like" Woman's Bean Project on Facebook (FB name: Maddie Brubaker). I love the New Home basket. I entered the J.R. Watkins Naturals Household Cleaners giveaway. I follow the Woman's Bean Project on Twitter! 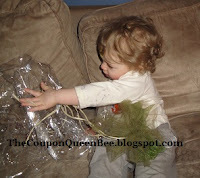 I entered Stonyfield Yobaby giveaway. The sugar and spice gift basket was my favorite on the site. I love the Sugar & Spice Basket! Just followed WB on Twitter.